Line a 8*8-inch pan with aluminum foil. Set aside. Place butter and peanut butter in a medium heatproof bowl, and microwave in 1-minute intervals, stirring the mixture in between each interval, until melted and completely smooth. Add vanilla and salt if using. Add powdered sugar and stir with a wooden spoon. The mixture will become thick. Press into the prepared pan and place in the fridge for 2-3 hours until completely set. cut into 40-50 squares, or any size you want. 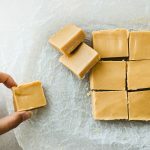 Store fudge in an airtight container in the fridge for up to a week.